9H-carbazole is an aromatic molecule that is tricyclic in nature, with two benzene rings fused onto a 5-membered pyrrole ring. 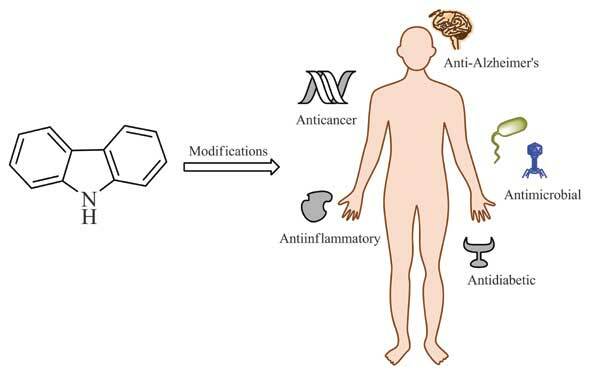 Obtained from natural sources or by synthetic routes, this scaffold has gained much interest due to its wide range of biological activity upon modifications, including antibacterial, antimalarial, anticancer, and anti-Alzheimer properties. This review reports a survey of the literature on carbazole-containing molecules and their medicinal activities from 2010 through 2015. In particular, we focus on their in vitro and in vivo activities and summarize structure-activity relationships (SAR), mechanisms of action, and/or cytotoxicity/selectivity findings when available to provide future guidance for the development of clinically useful agents from this template.